A glow in the dark theme is a hit with any age group! Black light rental is an affordable way to achieve a glow in the dark effect in a school gym. The big question is how many black lights should you rent? When you pop in your square footage or gym dimensions in the black light quantity recommendation calculator, the calculator is going to give you a very large number because its assuming you want to black light the entire gym. More likely though is you can consolidate the effect into a much smaller area (like a dance floor in the center), and use a smaller number of lights to get the same effect. For example, here is a photo sent in from a rental customer in Paramus, New Jersey who successfully got a great effect with just 10 black lights in a large gym. 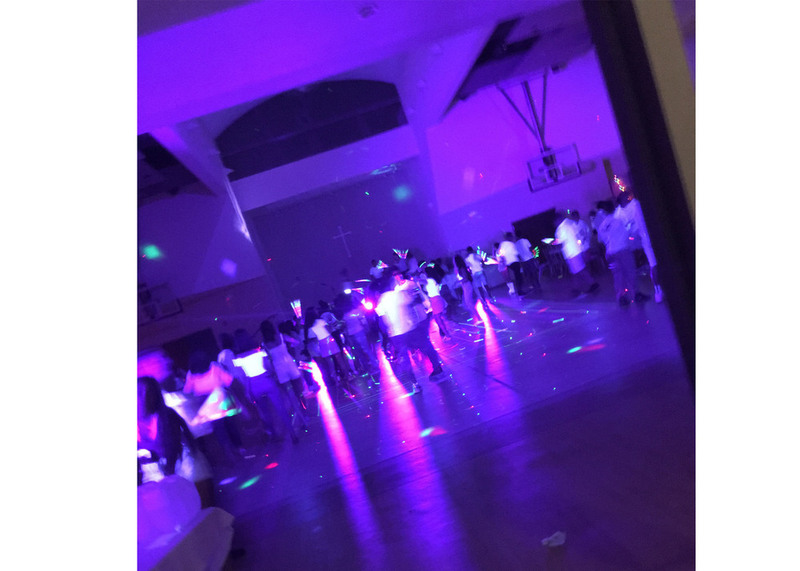 The black lights do get booked up fast, so put in a reservation today to guarantee availability for your next school dance with a glow in the dark theme!